“Honesty and transparency make you vulnerable. Be honest and transparent anyway." - Mother Teresa Do you reveal and present your true self to the world? How can increased personal vulnerability result in greater professional successes? When considering gender roles, do you occasionally idealize a bygone era? 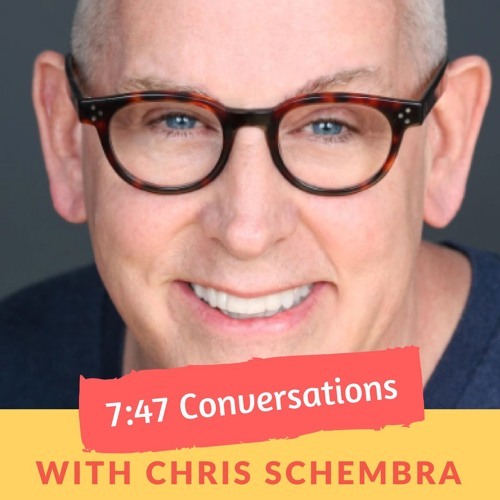 Join host Chris Schembra in this week's episode of his podcast series, 7:47 Conversations, as he welcomes performer and entertainment producer, activist, community leader, and former Disney Mouseketeer, Ray DeForest, who may also be known to some as his popular theatrical character, Doris Dear. Winner of the 2016 MAC Award, actress and comedienne Dear has been featured in numerous movie and TV productions, and has starred in her own sold out cabaret-style shows. In addition to entertaining audiences and raising funds to support theatre development, Mr. DeForest is an Executive Board Member of the Pipeline Theatre Company and Member of the prestigious Dramatist Guild of America. It is through his lifelong love of theatre that Mr. DeForest nurtured his storytelling and comedic talents, as well as his ability to connect with an audience and take them on an emotional journey. "Art requires reaction," he proclaims. Long before theatre life beckoned Mr. DeForest to Manhattan, he found himself growing up in 1950-1960s Staten Island, where idyllic "Americana" was a real-world version of Norman Rockwell's iconic paintings. But what is one to do when they don't fit the traditional mold? "Admitting who we are is never easy," states Mr. DeForest. But, this challenge of self-expression found a creative outlet through character development and performance, and continues to be richly rewarded by audiences who react to the experience and find a safe space in his character's maternal presence. Bravo! In 2015, the 747 Club was founded by Mr. Schembra to create a conversational environment promoting Authenticity ~ Empathy ~ Vulnerability ~ Safety. In sparking dialogue between people from disparate backgrounds and experiences, with different interests and viewpoints, a sense of community has formed within this shared experience, creating real understanding and an acceptance of others. Through this podcast, a wider audience will now learn about the 7:47 Club’s incredibly important mission. Learning, listening, and growing through shared experiences ~ Welcome to the 747 Club community.